HOW DID YOU GET STARTED RIDING DIRT BIKES? I’ve been around dirt bikes since I came out of the womb! My dad always raced for fun with his buddies, so I spent a lot of time at the track growing up. It wasn’t until I was 6, turning 7 that I asked my dad for a dirt bike for my birthday. On my 7th birthday, my dad picked me up from school with a PW50 on the trailer and a new (used) pair of boots in the truck and we went riding! WHAT BIKES HAVE YOU RIDDEN AND HOW DID YOU MAKE PROGRESS? I learned to ride on that PW50. I ran in to ditches and fences but I got the hang of it pretty quickly. I kept riding it until I was 9!! By that age, most kids had the oil injected KTM50s, or 50JR or SR bikes; they don’t stay on the PWs for very long, but I had ridden a KTM50SR that I didn’t care for, so then I went straight from the PW50 to a KX60. The ole KX60 was what I learned to shift and use the clutch on. It was a raw powered bike and It was pretty hard to ride from what I remember. I rode that bike for a year then moved to an RM65. Once I learned to shift and use the clutch on the 60, riding the RM65 was a breeze! By the time I was on 65’s, racing had become a lot more serious. We put a lot of time into learning proper cornering techniques, jumping, and just getting faster in general. I did another two years on the RM65, then two years on an RM-85 and a year on a KTM105. My 85s and 105s were great bikes. I started to get a lot faster once I was on 80s. Being on a little bit bigger of a bike gave me more confidence to jump bigger jumps! Then I switched to a YZ125 (4 or 5 different bikes within 6 years) I rode 125’s for what seemed like forever. I also had the most injuries I had ever gotten in my entire childhood of racing once I was on big bikes. So, I would say the transition was a challenge for me. I eventually got the hang of it. I really liked the 125’s and I put a lot of time and effort into improving my riding skills in those years. Next came my YZ250FX which I rode for 2 years. This was my first 4 stroke bike! I waited a long time to switch to four strokes because I liked the light weight two stroke bikes in the woods. Learning to ride a four stroke was so different. The bike was heavier, there was engine brake, and well it was just totally different. I would say it took me an entire year of racing before I really got the hang of it. This bike ultimately lead me to win my first national title so I’m quite partial to it. Next, came my KTM250XC-F (1 year). Switching from a Yamaha to a KTM was definitely one of the hardest challenges I’ve faced so far in my racing career. I had ridden only Yamaha for the past seven years. The KTM handled very differently, the suspension was different, just everything about the bike. My team and I put a lot of time and effort into getting myself comfortable on the bike last year and it paid off. My current bike is a KTM250SX-F. This is my second year riding KTM’s and I truly love these dirt bikes. I am very grateful to receive the support that I do from KTM. CAN YOU TELL US A BIT ABOUT YOUR EARLIEST YEARS RACING? My earliest years of racing started out with motocross. We raced locally for a few years. And when I say locally, I mean we traveled to Indiana, KY, and TN and all over the state of Ohio. My dad always encouraged me to go faster, jump bigger jumps, beat more people, and to just become a better rider always. You know, the things dads do. In 2004 at the age of 12, Dad told me we were going to try and qualify for Loretta Lynn’s motocross. I was able to qualify although my results weren’t the best. I was just a kid seeing motocross at an amateur national level for the first time. From that year forward it became my personal goal to win an amateur national title which I think instilled that drive inside me to become the best rider I could be. My dad spent so much time and money to make sure I could practice at least once a week and race every weekend we were able to. Our focus was to get to Loretta’s each year to fight for a better finish and eventually a title. 2007 was my last year I was able to race the Girls 9-13 65cc-105cc class at Loretta Lynn’s. I was so confident I was going to win that year. Kiara Fontanesi (a now 5x World Champ in Europe) showed up that year for her first time and got the win. I came in second and never won an amateur national title. 2008 was my first year on big bikes. I got a brand new YZ125 and I was ready to go race with the big girls. Unfortunately, I broke my back early in the qualifying season which resulted in a spinal fusion that took me out for the year. In 2009 I was back in action and ready to give it another go. I practiced a lot and tried pretty hard to improve my bike skills. I made it to Loretta’s and finished in the top 10 in the Women’s 14+ class. 2010 had no plans for me to race a dirt bike. I suffered two major injuries six months apart and I didn’t accomplish much. Motocross is a grueling sport and I had done it for my entire childhood. My dreams of becoming a professional motocross racer seemed hopeless. At that point I was pretty tired of getting hurt and I just wanted to ride for fun. The first GNCC I raced was in 2011. I had spent the previous years on and off the bike with injuries from motocross. 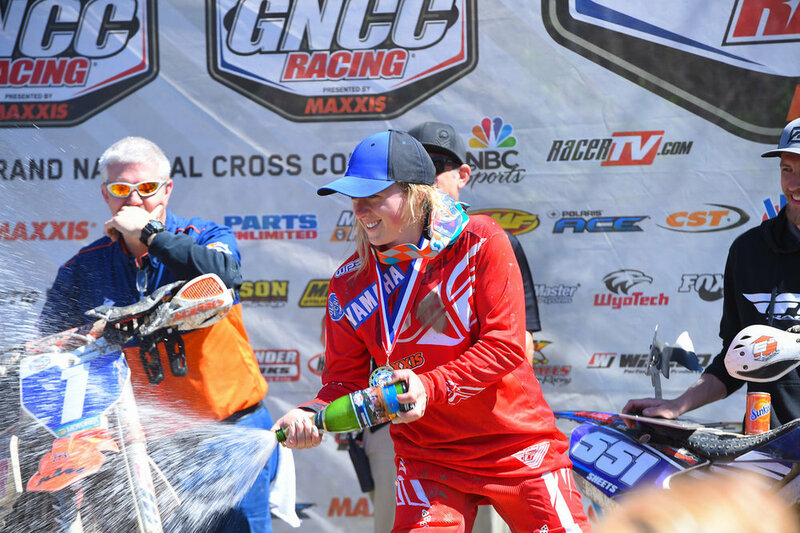 So the four GNCC’s I raced in 2011 were just supposed to be for fun but it quickly became something I took very seriously which lead me to race the full series in 2012. As a lower middle class family with my parents raising 3 kids in the house, things were hectic. I played other sports growing up too like soccer, softball, and basketball; as did my sisters. I literally owe it all to my dad and mom for all they have done for me. Racing dirt bikes has made me the person I am today and I wouldn’t change a thing. FOR RIDERS WHO HAVEN’T YET VENTURED INTO THE RACING, BUT ARE DYING TO GIVE IT A TRY, WHAT INSIGHT CAN YOU OFFER? I would recommend doing a riding clinic or take lessons from a better rider that can teach you basic techniques. This way you have a bit more confidence on the bike going into a race setting. I have always benefitted from riding schools even if I am the one teaching! Practice makes “permanent”. If your form and techniques aren’t correct, it’s good to put yourself in check every once in a while, so you can continue to improve. There are so many awesome local harescramble series and motocross series that cater to all levels of riders. Ask around and find out which tracks are easier vs the ones that may be a little more technical and give it a try! DO YOU HAVE ANY FAVORITE RACES TO DO EACH YEAR? My favorite GNCC is the Ironman in Indiana. There is always such a huge turnout there and racing against 900 other bikes on an 11 mile loop makes it pretty wild. I love the energy from the crowds on the hill climbs, the smell of fall, and the cold creek crossings. Everybody wears pink to show their support and help raise money for breast cancer. It’s just a good vibe there. This year will be my 8th year in a row racing that race. THIS YEAR YOU SUFFERED A BAD INJURY, CAN YOU CATCH OUR READERS UP ON WHAT HAPPENED? At the X-Factor GNCC in Indiana I crashed at a pretty high speed in a field section. I came out of it with a severe concussion and broken jaw on both sides. I had surgery so they could plate bones and wire my jaw shut. I spent the night in the hospital, went home, drank smoothies, and ate baby food for 6 weeks. At first I thought it was one of the easiest injuries I’ve ever had to deal with, because I was still able to walk around freely and do my day to day activities. I just couldn’t train as hard or ride. It actually ended up being a very mentally challenging injury to overcome. But as we all know; racing is dangerous and things happen. I just tried to keep it positive and know that I would come out of it as a stronger person and rider. I consider myself lucky that it wasn’t worse! YOU WERE PART OF THE WOMEN’S ISDE TEAM IN 2017, WHAT WAS THAT EXPERIENCE LIKE? It was a really cool experience. First of all, it was such an honor to be selected to represent the USA. It was very challenging, one of the hardest things I’ve ever accomplished. Getting to ride your dirt bike for 8 hours a day through farms, countryside, backyards, woods, and main roads was definitely the coolest part about it. If an average joe went to tour the country of France, they probably wouldn’t have seen it in the same way that we did. It was very surreal and something I will remember forever. WHAT ARE SOME OF YOUR BIGGEST POINTS OF FOCUS AS YOU APPROACH THIS YEAR’S ISDE? Endurance racing is my strong suit so the hardest thing about ISDE for me is flipping the switch from a steady speed on the technical transfers to a full sprint level speed at the special tests throughout the day. I’ve been training really hard this year and with the help of my awesome boyfriend Tyler; we’ve been putting a lot of work into my initial speed on the track, trying to push the limits. It’s made me a lot faster. Racing the Full Gas Sprint Enduros has helped me a lot also. It’s set up similar to ISDE but without the transfer trails. We are still working hard! My USA teammates, Brandy Richards and Tarah Geiger are both really strong riders as well. I can’t wait to see all of our hard work pay off in Chile. WHAT TYPE OF TRAINING DO YOU DO (ON OR OFF THE BIKE) TO STAY IN TOP RACING SHAPE? I focus a lot on my nutrition because I believe it’s the most important. You have to have good energy to do the things that make you stronger and keep you in shape. Cycling, mountain biking, running and strength training are things I work into my days outside of riding. I almost enjoy training as much as I do riding my dirt bike! I kind of have to find joy in it and mix it up or it can become very humdrum. It’s basically always a competition with my own self. HOW HAVE YOUR SUPPORTERS HELPED YOU? I’ve had so many great people and companies as sponsors over the years. I wouldn’t be where I am today without the help of those people. People have sacrificed time and money to help me improve as a racer on and off the bike. My biggest supporters have always been my parents. My boyfriend Tyler is such a great sport. He helps me be a better person and understands my love for racing just the same as his. My best man friend Johnny has given and taught me so much over the past few years of my racing career. I can’t thank them enough. Racing a dirt bike may not be a team sport but you definitely can’t do it alone! Raffle proceeds from Over And Out’s first event in 2018 were donated to help support the US Women’s Trophy Team in the FIM International Six Days Enduro (ISDE). Click here to read more about the team and the donation in an interview with team manager, Antti Kallonen of KTM North America. 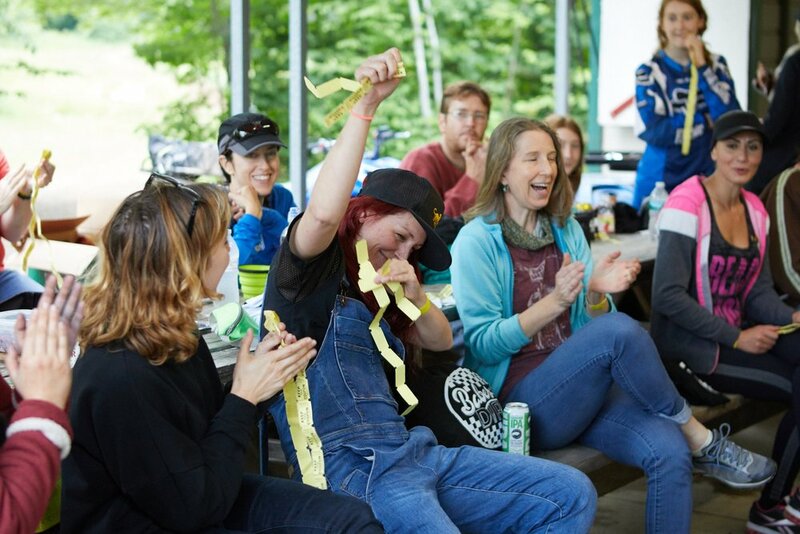 One of my goals for Over And Out is that it help serve as a gateway for female riders of all levels to discover more opportunities for riding, be it through connection to new friends and a broader riding community or by building up the skills and confidence to join a race or try a longer or more difficult ride. For me, as a casual recreational rider, meeting Amelia Kamrad became my own gateway to trying my first race. I was stoked to experience it, but what I actually ended up getting out of it, I never expected. That is: the addictive high of working hard at something I love, but as part of an incredible team. I played team sports all through high school and college, but this experience was different. Maybe because there were only six of us. Maybe because riding enduro is a sport I love more than anything I've ever done...I'm not sure, but I have to thank Millie for recruiting me to be on the team, and I've got to do it again! I asked Millie to tell us a bit about the race experience. Sure, we're not the first all-girl team, nor did we capture first place, but it's all too common to read interviews with people who are already killing it. I wanted to share some information for those of you who might be trying new things in the world of riding two wheels, just like we are. I hope you enjoy and that it maybe encourages you or someone you know to give something new a try, be it a race, an event or simply riding for the first time. TELL US ABOUT THE NORTHEAST 24 HOUR CHALLENGE! The Northeast 24 Hour Challenge is a true test of endurance! Riders tackle an 11-mile course, but aim to complete as many laps as possible within 24 hours. You can form a team of up to six people, or ride as an ironman or woman, aka just one rider for the full 24 hours. The race starts with a Le Mans-style start - riders start with a run to their bikes, having to start them up before taking off and heading into the woods. Each team also has a transponder that gets handed rider-to-rider to track their laps. The race goes for a full 24 hours, meaning riders continue to ride throughout the night, and must make use of headlights and helmet-mounted lights to make their way through the densely wooded course in the dark. WOULD YOU SAY THIS IS THE TOUGHEST PART OF THE RACE? Riding all through the night definitely adds an additional test of endurance. The pits get quiet while riders who aren't currently riding try to get some sleep, and some teams aren't able to keep a rider on the course through the early hours of the morning. Managing sleep, hydration, and nutrition are key, so riders can continue to put in laps throughout the 24 hours. Watch Part 1: Team Theft Recovery at the Northeast 24 Hour Challenge. WHAT MADE YOU DECIDE TO ASSEMBLE AN ALL-GIRLS TEAM FOR THIS YEAR'S RACE? Last year I joined a friend's team, and I had a ton of fun. I thought it would be a really interesting experience tackling this with five other women. This was in November 2017, and with Over And Out's first women's riding event on the horizon I realized I'd be meeting a number of female riders keen to take on new challenges. 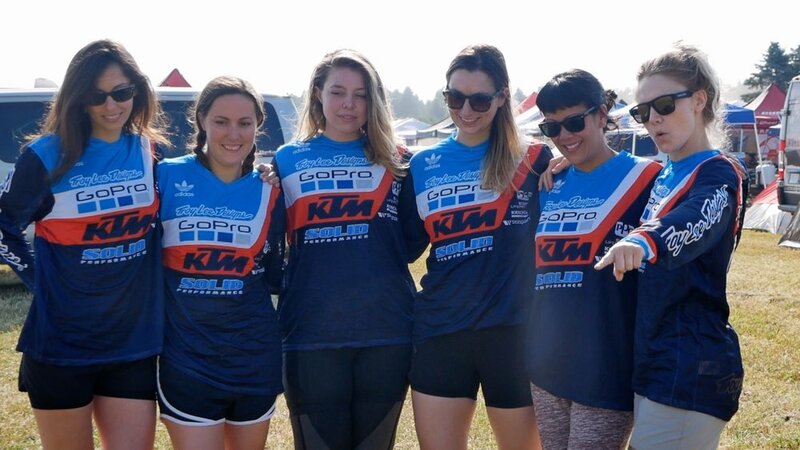 There weren't that many female riders at the 24-hour challenge, so I thought if I could gather five other women to join me in a team, I'd be significantly adding to the number of women riding at this event. Hopefully, our participation this year will inspire more women riders to take on this challenge next year! WHO ENDED UP ON YOUR TEAM AND WHY DID YOU SELECT THEM? We had a few changes to team lineup over the year. Because race entry opens in January but the race isn't until July, naturally some changes came about throughout the year that forced two girls to drop out by early June. BUT, Over And Out was set for the end of June so I knew I'd likely meet some more riders game to join. I met so many positive, awesome female riders at OAO, I was able to fill the open spots! The final lineup of "Team Theft Recovery": Tracy So, Megan Babineau, Ashley Lusky, Liz Kiniery, Kelly McCaughey and me, Amelia Kamrad. All of the girls that joined the team are great riders, but riding ability was only a small part of what makes a good team. I was hoping to find teammates with positive attitudes, ready to take on an endurance challenge, and I couldn't picture any of these girls giving up easily. I also knew right from the start that they would help to build each other up; it's super important to be team-focused. When we finally settled all six team members, it felt right. One thing we did was join Erika Hurst's Gnarly Babes Fitness program together! 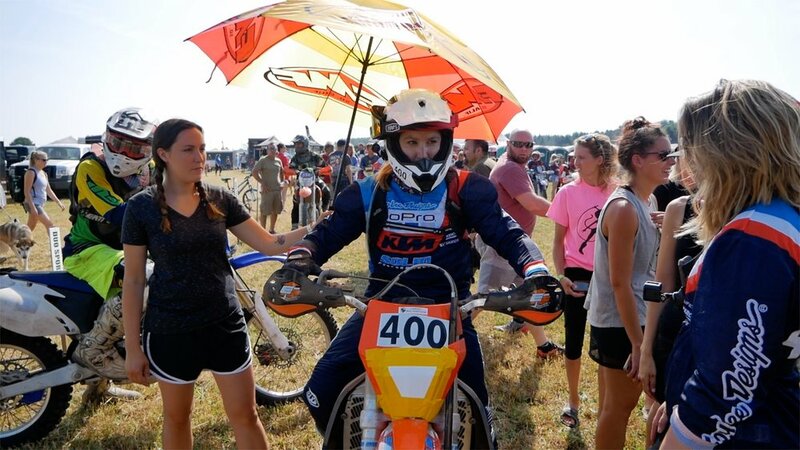 Erika was one of the first east-coast female riders profiled on the Over And Out blog. She started a fitness program for women who ride, and took us on as clients. The majority of our team committed to the fitness program to improve our strength, modify eating habits, and also stay in touch and motivate each other to stay fit and healthy as the race approached. In 90+ degree weather, your physical fitness (or lack thereof) really comes into play. It's a recipe for complete and utter exhaustion if you haven't prepared in advance. By around week 4 I could tell the program was making a difference in my strength and in my riding. We also needed to prep our bikes appropriately. While the race lap is only about 11 miles, if you have an issue with your bike it could take you two hours to get hauled back to the pits. That's two hours that you won't have someone completing laps for your team, and it will definitely make a difference in the race. Solid Performance KTM (based just outside of Philadelphia) came through for us in so many ways: They let us borrow a KTM 250xcw that they professionally lowered 2 inches. Funny story: the bike was actually stolen from their shop at one point. It was ridden in inner city Baltimore for a while before it got impounded and Solid Performance got it back. This is where our team took the name "Theft Recovery" from! They of course put a lot of work in to ensure this bike was in top shape to race. Solid Performance is the only WP suspension shop on the East Coast (they lowered my Husaberg for me last year - a MUST do if you've got short legs like me!). A lot of women don't realize the difference that lowering a bike can make in your riding. These bikes come stock built for the average size man, so lowering the bike by 2 inches made it much more accessible. Solid Performance even came through big time by lowering Tracy's bike for her the week before the race! They gave us assurance, confidence and amazing support! I Imagine (and hope!) we might have some women who end up reading this who are curious about trying a race for the first time. During the actual race, WHAT WAS IT ACTUALLY LIKE FOR YOU GIRLS? Well, like I described above, a 24-hour race is inherently a test of endurance. It was fairly exhausting! Basically, when you aren't expending energy actually riding, you're trying to chill in between rides, conserve energy, hydrate, eat, fix things on your bike that you may have broken on your last lap...and a million other things. It helped to be organized. We had organized areas for food, gear, prep, stretching and recuperation. And we helped each other. While a rider got geared up in anticipation of their riding time, other riders helped them do whatever they needed: bring them food, help find a piece of gear or tape or some other solution they needed. The weather also threw in a few challenges. We had a few thunderstorms roll through, so overnight the course turned into a soupy, muddy mess! Watch Part 2: Team Theft Recovery at the Northeast 24 hour Challenge. Oh yeah, by the time morning came around, putting the gear back on felt a bit like punishment. But before you know it it's time for the last lap to be ridden and seeing your teammate cross the finish line is an incredible feeling. We may have been exhausted and ready to get home and into a shower, but as we packed up our pit, gear and bikes we were already thinking about doing it all over again next year! Over And Out was created for a bunch of important reasons, but one BIG one is that we wanted to open the doors to some amazing riding land, and create a special riding opportunity just for the ladies. Over And Out has partnered with the Bear Creek Sportsmen riding club of Hancock, NY to do just that. Together, we're bringing you exclusive access to this amazing property with routes and guidance for every level of rider! Bear Creek Sportsmen is an AMA sanctioned riding club that formed back in 2002 with the express purpose of preserving recreational riding land here in the Northeastern US. Facing the dilemma of a shrinking availability of riding land, the club members banded together to preserve their own private woods and dual sport riding heaven. Not only are they passionate about preserving this land, they’re passionate about riding. The club is made up of people who have decades of experience both in racing, competing, and running events from Enduros, to Hare Scrambles, Dual Sports and Vintage events. This year will mark the 20th year of their infamously challenging Quarry Run Dual Sport. It is also the very FIRST year that they will be hosting a ladies-only ride: Over And Out! The Bear Creek property occupies over 1,000 acres of extensive and ever-expanding trails that are nothing short of amazing. While Over And Out will cater to ALL levels of riders, the property does boast some of the most challenging terrain around. Graham Jarvis at Bear Creek Sportsmen. Photo by Steve Hatch Racing. 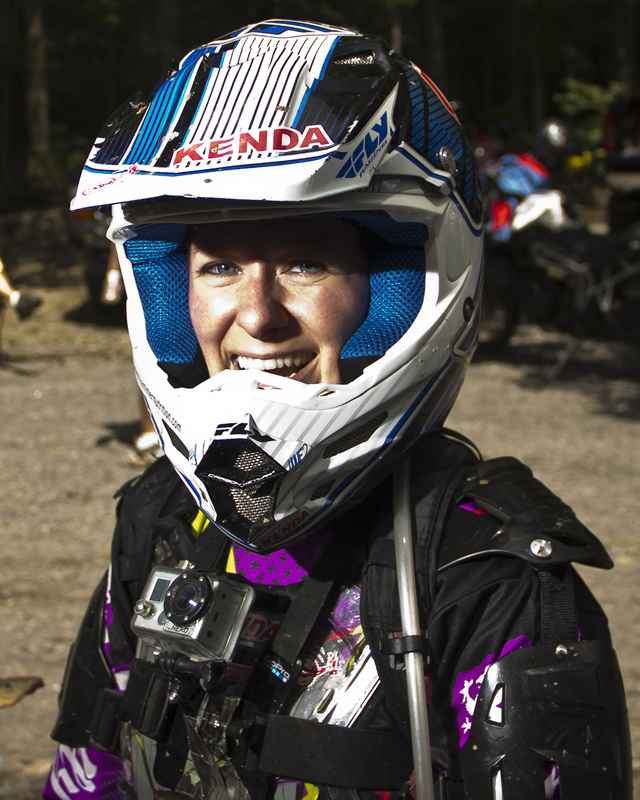 The Club has hosted ISDE Qualifiers, the first US World Enduro in 2006 and another in 2007. 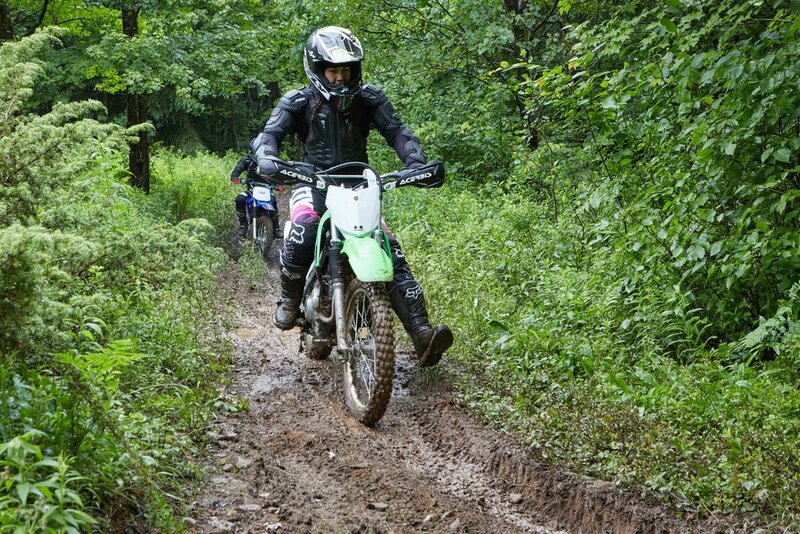 Their Quarry Run Dual Sport is one of the most challenging events around, bringing riders from around the country. This past fall Graham Jarvis came to teach a private enduro clinic. I myself have ridden through forest trails reminiscent of the Pacific Northwest, have ridden down trickling stone waterfalls, and have stopped in the middle of rocky passes to gape at bald eagles flying overhead. We’ll also mark some loops in the woods for different levels of riders. They're meant to be a challenge but nothing's better than working your way through a tough trail with your friends. Our sweeps will be riding these trails to help you out and ensure safety. We'll also have a fully guided advanced ride on Saturday that riders can sign up for onsite. Just a heads up: "advanced" here is like really, really advanced. So if you're that kind of gnarly babe, we've got the trails for you too! The local area offers amazing riding for partially-street equipped and heavier dual sports and adventure bikes. We will be offering mapped routes for these bikes to ride off-site on a variety of rural terrain. 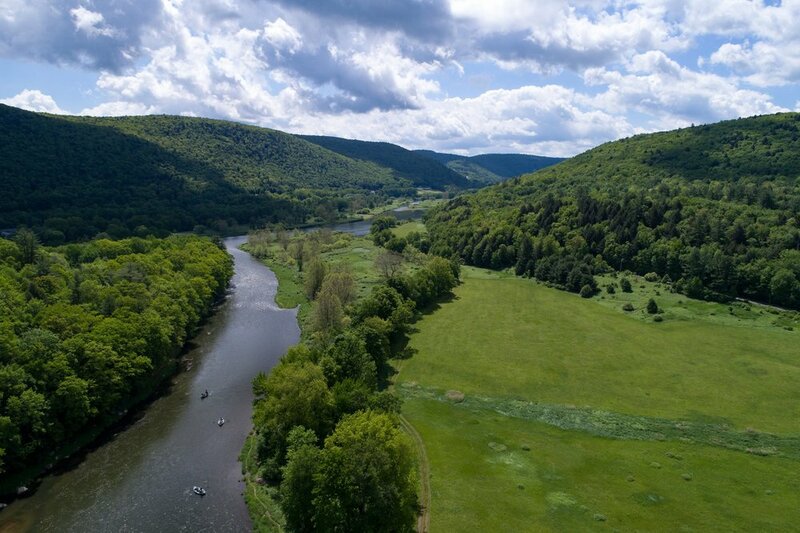 The town of Hancock is known as the "Gateway to the Upper Delaware" and it sits right where the Delaware river splits into an east and west branch at the base of Point Mountain. The club has a great relationship with the town of Hancock, and serves as an asset to the community by drawing in visitors to these few public events each year. There are convenient stores, diners, restaurants and hotels within 2 miles of the club property. For those of you riding OUT on the street-legal routes, stop into the local establishments in this quaint town! Explore more at destinationhancock.com. Bear Creek Sportsmen donates to local organizations each year, and members are always seeking ways to give back through their events. Proceeds from Over And Out tickets and raffle will also be supporting these efforts, something you can feel pretty GREAT about! Stay tuned, and sign up for our emails, because full event information and registration will be going live March 14th! 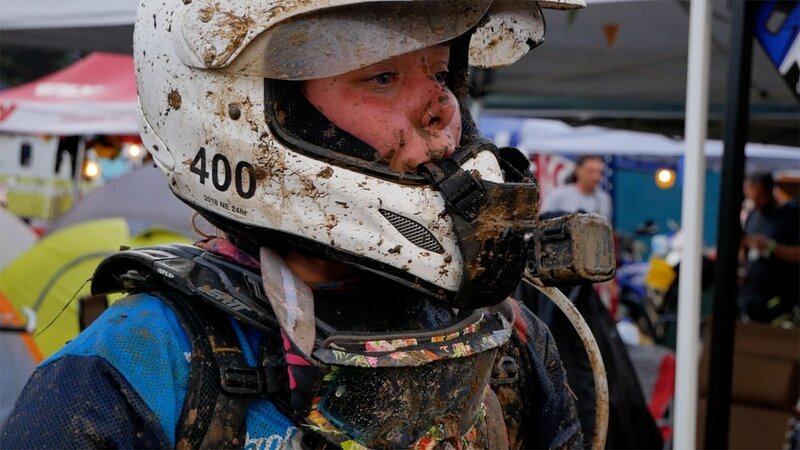 It's weird as hell publishing an interview of yourself, but I had the pleasure of being interviewed by fellow rider Amelia Kamrad about Over And Out so you could learn a little more about me and the Over And Out event! WHAT IS YOUR INVOLVEMENT WITH OVER AND OUT? Well, I created Over And Out! 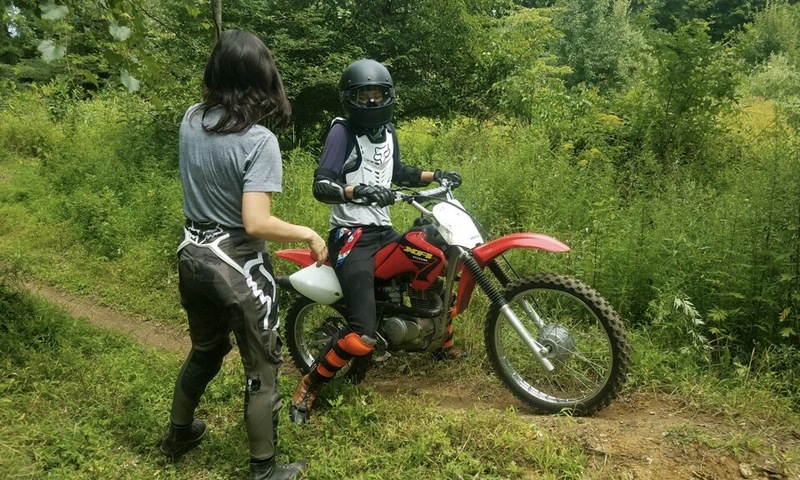 :) I wanted to create a way for more girls to experience riding off-road but also get to see and learn the difference between a variety of terrain and riding styles. Here in the Northeast, public recreational riding area is nearly non-existent. At the same time woods riding and enduro races are huge in this part of the country. There’s a gap between people who would like to learn or experience more off-road riding and those who have access to land or feel skilled enough to join in a race. Community is key to bridging this gap. While I’m the main driving force behind Over And Out, there are many others involved, all working together to make this a unique and fun opportunity for female riders in the Northeast. WHY MAKE THE EVENT JUST FOR WOMEN? That part happened kind of organically. I’ve always ridden with men, and there’s nothing wrong with that. But over the past few years more girls have become interested in riding dirt, and some girls I knew started asking me where they could try riding. So, I had a small group of girls who’d never ridden dirt bikes come over to my house to give it a try. Well, as much as I love riding, I found just as much joy in watching them ride dirt for the first time: Teaching them a few basics, watching them bobble off to a start, watching some of them take to it like complete naturals! One girl said “I can’t stop smiling inside my helmet!” and I’ll never forget that! SO THAT WAS PART OF PLANNING FOR THIS EVENT? Pretty much! I already had some plans in the works for a public event, but this was a great way to further connect with other female riders, and meeting these women was an awesome experience. I could go on and on about that weekend, but what I loved most about it is that those girls were there because of one fact: they wanted to ride, and they made it happen. Some of them heard about it through the grapevine and contacted me. Some borrowed bikes and trucks; some carpooled with others they barely knew. They were presented with the opportunity and they made it happen. To see it all come together was very cool. Everyone was easy going, positive and friendly. And in the morning we got suited, booted and started up our engines together. And since then, girls from that group have connected individually to go riding together, so by meeting each other it created even more opportunities for some of them to ride. OK, SO TELL US ABOUT OVER AND OUT! To make a public event possible, Over And Out has partnered with the Bear Creek Sportsmen riding club of Hancock, NY. The club owns private property in the town of Hancock and holds just a couple of public riding events each year. Over And Out will be their first ladies-only riding event! Over And Out is a two-pronged event: It’s for dirt, woods and trail bikes that can ride over the mountain on marked trails, as well as street-legal dual sport and adventure bikes that can ride out on mapped dirt routes that we will provide. There are many different styles of off-road riding and bikes: dirt, woods and trail bikes, dual sport and adventure bikes. This event seeks to include almost all of them, and all levels of rider. The only type of riding we’re not catering to this year is motocross. This event is not a race or a hare scramble, it's a casual friendly riding event with options for everyone, from nervous beginners to long-distance adventurers to serious woods rippers! WHAT CAN RIDERS EXPECT AS FAR AS TERRAIN GOES? There’s going to be something for everyone. There are miles of grass tracks and fields to ride. There will also be a variety of marked woods loops ranging from beginner to intermediate to super gnarly! We will also be doing a guided ride on Saturday for advanced riders. For riders who have dual sports (on-road/off-road) and adventure bikes, we’ll be providing mapped routes that explore a variety of dirt roads and terrain throughout the area. I’ll be sharing more specifics about the property, the terrain options and bike details through the blog and website in the coming months. WHAT ABOUT THE REST OF THE EVENT, WHAT CAN ATTENDEES EXPECT? The event will be focused on riding and having fun, plain and simple. I think the atmosphere is going to be great. It’ll be laid back, very low pressure, but also offer challenges and new experiences. I've met some of the greatest people through riding, and I expect that I'll meet many more at Over And Out. My partners at Bear Creek Sportsmen are also fantastic, so we'll all have a really good time. There is SO much for me to share in the coming months I can’t even begin to tap into it all here. Stay tuned for details in the coming months! TELL US A BIT ABOUT YOU, THE RIDER. I always tell this story because I think it says it all, but the first time I ever rode was when my husband (then boyfriend) took me to his friend’s house to learn. They all grew up riding and racing, and he had an XR100 - perfect for me to learn on. Fast forward 5-6 years and I still love riding. I've gotten to experience some really hard terrain, and I immediately fell in love with the feeling of exploring out in nature, and the feeling of making progress as a rider. Riding isn't easy. Some days are freezing, some are sweltering hot. I've hurt myself or had bad days, but not once I have even thought about quitting. I just love riding. So let's riiiiide! If you haven't been following Crystal Levesque, you're missing out! Her Instagram photos and videos show that no obstacle is too tough and no trail is too gnarly if you commit to continuous improvement and approach it with the right attitude. She shows that being the best isn't about being a perfect rider. It's about hard work and dedication, accomplishments as well as the crashes and falls that get you there! You gotta pay to play, and Crystal always plays with a hilarious and vibrant personality and a super positive attitude. HOW LONG HAVE YOU BEEN RIDING, AND HOW'D YOU GET STARTED? I’ve been at it for 11 years now. Riding dirt bikes had never really crossed my mind until a former boyfriend surprised me with my first bike – a DRZ125. Honestly, I initially wasn’t very interested in riding. WHAT MADE YOU STICK WITH IT? The more my boyfriend at the time took me out to explore, the more I fell in love with it. I’ve always been someone who enjoys challenges and overcoming the frustrations inherent in learning something new. Riding quickly left me wanting to prove to myself that I could do more – I could be faster, I could learn to wheelie. It spiraled into this crazy addiction of always wanting to achieve something greater. At the same time, I also find a calm in riding, so its become therapy for my mind, body and soul! WHAT TYPE OF RIDING DO YOU DO ENJOY THE MOST? I spent a decade riding motocross tracks, but I’ve recently fallen in love with trail riding and tackling endurocross obstacles like boulders and downed trees. I love exploring and seeing new terrain and mountain sides. I’m always linking up with new people and either showing them around my local areas or joining in on others rides across the border. 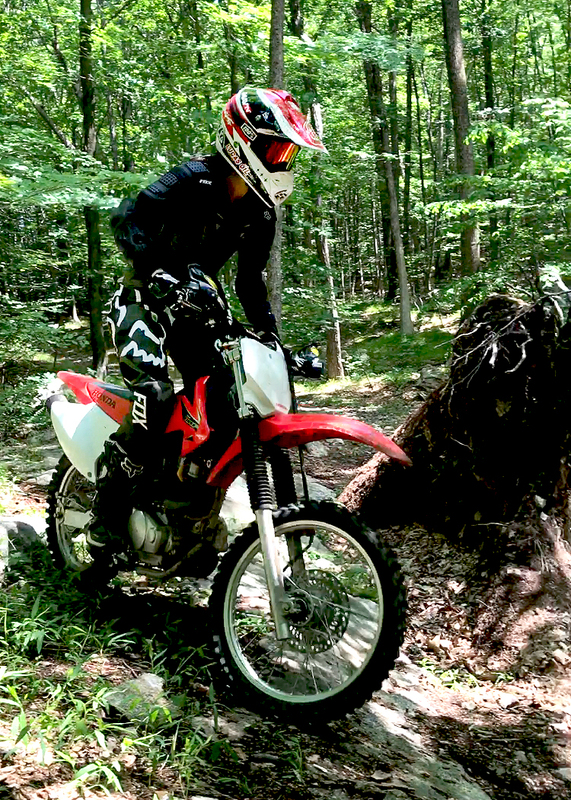 Nothing beats the adrenaline rush you get from riding through the mountains over gnarly rocks and roots! It really pushes me to my limits and I’ve learn so much more about myself and my bike. WHAT BIKE DO YOU RIDE, AND WHY? When transitioning from motocross to woods riding, I really wanted to have the same sort of set up in the woods. I chose a 2014 KTM 250XCF because I was comfortable with the power delivery and handling of a four-stroke. Fast forward one year and I am ready to make some major changes with bike choices. I recently had the opportunity to ride a Husqvarna TX300 two-stroke, and that was a game changer for me! WHAT EXPERIENCES ON DIFFERENT BIKES HAVE TAUGHT YOU ABOUT YOUR RIDING PREFERENCES? I am proud of the gains I made on my four-stroke this year. Four-strokes are great bikes for steep hill climbs or fast and flowy single track where there are less obstacles in the way, but they have clear disadvantages for my type of riding and my size. They’re heavier bikes to maneuver in the woods, making movements like pivot turns and climbing rocky sessions tough at times. I don’t run a Rekluse in my bike, so I am always on the clutch. Four-strokes tend to overheat and flame out in the gnarly terrain. This is a constant battle as I take on more technical terrain and bigger log hops. So back to my new-found love of two-strokes… I found the bike to be a lot lighter and much easier to get through the slower tough terrain. The bikes don’t overheat as easily and the power is there when you need it. One of the biggest benefits of the two-stroke is the ability to get the front tire off the ground with ease, making it much easier to get over the bigger logs and rocks. The bike is just so nimble! WHAT WAS ONE OF THE BIGGEST CHALLENGES WHEN YOU FIRST STARTED, AND HOW DID YOU OVERCOME IT? Haha, well first I had to figure out how to keep the bike upright for more than 10 feet! Learning to balance the weight of the bike can be very challenging at first, especially in sandy terrain. I improved a lot by working over and over on the small things like balance and proper body form. DO YOU EVER TALK TO YOURSELF IN YOUR HELMET? IF SO, WHAT DO YOU SAY? OMG I don’t think I would survive a ride without humming a tune or talking to myself! I am guilty of swearing a lot through the tougher terrain, and quite often you will hear me laugh after a gnarly crash which is my way of celebrating the fact I am still alive! WHAT ADVICE DO YOU HAVE FOR A NEWER RIDER? Be patient! I know it’s so easy to start something new and want to be the best at it right away, but this sport takes a lot of determination, dedication, and patience. Don’t give up when you have any sort of setbacks and remember that baby steps are better than no steps. I conquered a lot by just always showing up despite many failed attempts and it made those moments of success that much sweeter! And take advantage of every opportunity to join a group ride or learn from a more experienced rider. We all start somewhere and as long as you understand the process to becoming a great rider through observation, practice, advice, and persistence you will go further than you think. WHAT'S THE SINGLE BEST TIP ANYONE EVER GAVE YOU ABOUT RIDING? I’ve had the opportunity to ride and learn from some really talented individuals, and one thing that was always repeated to me was proper body positioning and form on the bike. I started to practice with small drills like figure eights, small wheel hops, weighting the pegs and wheels. This helped me to understand where my body needs to be when jumping logs and rocks or navigating single track. I never worry about speed. As you conquer different techniques, your speed will pick up without you even noticing. So, #1 piece of advice: practice the small stuff like balance and body positioning any chance you can get. WHAT RIDING PLANS DO YOU HAVE IN MIND FOR 2018? This year I am going to do my best to attempt a few races, locally and throughout the United States with friends. I’ve been at this a year now and I’m eager to push myself to the next level and see what I can accomplish by adding some more challenging riding to my year. I have a few trips already lined up: I will race my first desert-style race in April at the Odessa 100 and will be in Salt Lake City, Utah in May to adventure in the infamous Moab. I want to host some ladies rides locally as well. I did a few of these last year and they were a blast! I love meeting new women in the sport and learning something new from one another. I’ll be flying by the seat of my pants for the rest of the year. I don’t do well with a schedule so I am going to live in the moment and see what kind of adventures I find and people I meet along the way. From racing to exploring new terrain, I will have a crazy year ahead of me! Last fall, I put the word out to get a bunch of different girls together for a riding weekend. Heather showed up and quickly became everyone's favorite riding buddy, coach and cheerleader all rolled into one. She's living proof that you meet the best people on two wheels. HOW LONG HAVE YOU BEEN RIDING DIRT BIKES? I learned how to ride when I was 4 years old, on a little Honda QA50! I was born into a motorcycle family - My Dad used to race, my Mom used to ride, and both of my older brothers ride - so it was in my blood! As a baby and toddler they'd take me for rides on the bikes, so it was only natural that I wanted to ride too. I only rode a few times a year up until I was about 12. Then I got involved in school sports and discovered boys and didn’t really ride for another 10 years or so. I rediscovered dirtbikes again at 22, and started racing at 26. So I guess you could say I was a bit of a late bloomer. WHAT MADE YOU GET BACK INTO RIDING? In college I played competitive sports that required intense training. When that ended, I moved back to NY, and felt this huge void. I'm extremely competitive by nature, and I needed something to focus that energy on. One of my brothers had just gotten a new dirtbike, so he offered me his old one to ride - a 1994 Kawasaki KDX200. I was 22 years old, and I went riding in the woods for the first time ever! I was a complete train wreck, haha! This bike was a tank. It was so heavy and I couldn’t touch the ground. I couldn’t make it over any hills or logs without help. I wrecked many times, and could barely pick the bike up when I did. After that, I was sore and exhausted, but I loved the thrill and the challenge. I was like, "This is what I’m going to do from now on!" And so I did! WHAT KIND OF RIDING DO YOU ENJOY THE MOST? I love riding and racing in the woods. I raced hare scrambles for 11 years, and then switched over to enduros for a few years. I love the challenge of the changing terrain, and the thrill of not knowing what obstacle might be coming up next. I would have to say that racing National Enduros are my favorite because of the format. I like the idea of being out there for 4-5 hours at a time, and (on most occasions) not covering the same ground twice. I love the constant terrain changes and the tight trail. DO YOU EVER TALK TO YOURSELF IN YOUR HELMET? I ALWAYS talk to myself in my helmet when racing! I curse a lot, so I probably can’t repeat anything here that I would normally say. I am usually telling myself to get my sh*t together haha. Joking aside, I do remind myself to breathe, focus, relax and not hold on so tight! WHAT BIKE DO YOU RIDE NOW, AND WHY? I ride a 2017 KTM 250XC, and I absolutely love it! I can’t say enough about the chassis, suspension and engine. It is by far the best bike I’ve ever owned. The center of gravity is low, so the bike feels lighter. And with its counter-balanced engine there is virtually no vibration. This is the first time I’ve ever had a bike that I didn’t feel the need to mess with… the stock gearing and suspension are perfect. WHAT HAVE YOU LEARNED FROM RIDING DIFFERENT TYPES OF BIKES OVER THE YEARS? My first smaller bike, the Yamaha TTR125L, was the best beginner bike for me and for the type of riding I was doing. I learned so much on this bike and raced it for a couple of years. Then I tried a two-stroke Kawasaki KX100. I raced that for a couple of years then up-sized to a four-stroke KX250F. This was a tough change: The bike was heavier, taller, and so hard to kickstart that my right thigh became noticeably bigger than my left one! Next, I got an electric start and made my way back to two-stroke through a streak of KTM's: a 250XCF-W, a 200XC, a 2014 250XC-W and the 2017 250XC I'm currently riding. Each bike helped me get to the next level, and taught me the importance of having a machine that's set up properly for the type of riding I'm doing. There are pros and cons of each. four-strokes have smooth power and stability, two-strokes are lighter and easier to start and pick up off the ground (which seems to happen quite a bit haha). It's really personal preference, and you learn so much the more you ride. WHAT ADVICE WOULD YOU GIVE NEWER RIDERS? 1. Never, ever ride without protective gear! I cannot stress this enough. Gear can be expensive, but trust me serious injuries are even more expensive. It is worth the investment to have good quality protection. 2. Don't give up or get discouraged. This is not an easy sport, and you are going to have bad days. Just remember that everyone has to start somewhere, and don’t be too hard on yourself. 3. Find the right bike for your height, weight and riding ability, as well as the type of riding you’re doing. Take the time to set your bike up to fit your needs. WHAT DO YOU THINK OF A LADIES-ONLY RIDING EVENT? A couple years ago I had an opportunity to join in a ladies-only ride day with Husqvarna. That was my first time riding with ALL women and it was amazing! I loved every second of it. 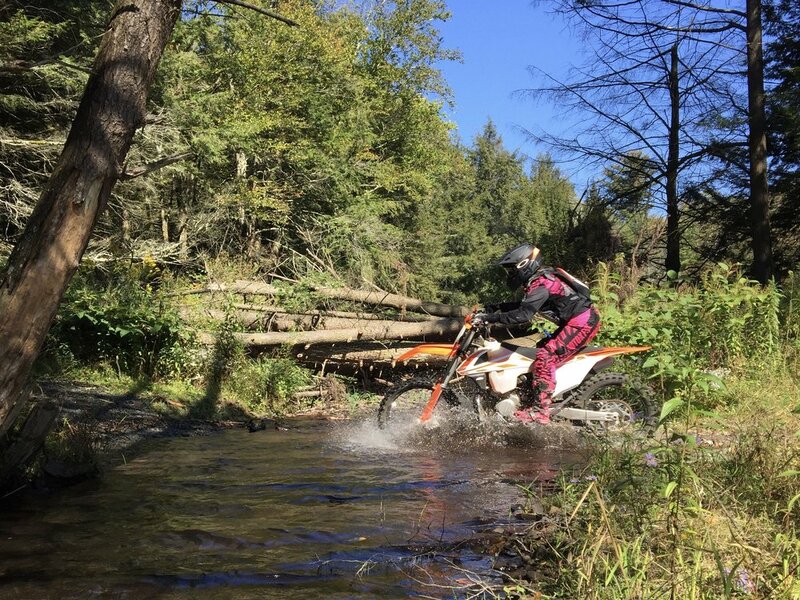 Fast forward to this past year, I was contacted by a girl I met through Instagram about an all-girls riding weekend, and I jumped at the chance to join in! She and I rode up together (which was the first time we actually met in person!) and that weekend I met a dozen more really great girls, all different types of riders. We rode together, helped each other out, and just had the best time! Turns out it was the planning event for Over And Out. I'm taking a little break from racing this year, so I'm really excited to have this event to be a part of and I'm looking forward to meeting some more riding buddies!